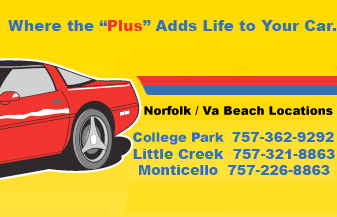 Alignment Service is available at our Monticello location in Norfolk. When Should You Check Your Vehicle Alignment? If you notice that your vehicle pulls significantly to the left or right when you are traveling on a straight, flat road with little cross-wind, or your tires are wearing abnormally, then your wheel alignment may require adjustment. You should therefore take your vehicle to a reputable garage like Accurate Tune Plus to have its wheel alignment checked. This is a simple process, which may require slight adjustment of front and/or rear suspension components. If your vehicle’s wheels are not properly aligned, this can cause abnormal wearing of the tires. Your vehicle has hit something (e.g. a curb, pothole, or major road hazard). You notice that your tires are wearing abnormally or unevenly. Wheel alignment can affect the amount of wear and tear that tires endure. The normal alignment on most vehicles is designed to minimize wear and tear and maximize driver and passenger comfort. Correct four wheel alignment will reduce wear on your tires, help increase their life and performance, and improve fuel economy. It will also improve handling and driving safety by reducing steering and stability problems. Misalignment can occur when hitting a curb or driving through a pothole, as well as in more severe circumstances like accidents, which can knock your vehicle’s suspension out of alignment. Misalignment can also happen as suspension components wear or when they are replaced. When wheel alignment is incorrect, rapid tire wear can occur especially on the edge of the tires, and vehicle handling can also be adversely affected. It almost certainly means that you will have to replace your tires earlier than expected. 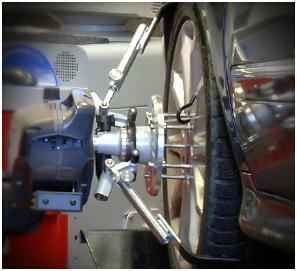 The purpose of correct wheel alignment is to provide optimum vehicle handling and to maximize the life of the tires. It can save you money, as tire replacements are required less frequently. Your tires will last longer. Your vehicle handling will be optimized. Your vehicle will drive smoother with less tire rolling resistance. Most front and rear alignment problems can be solved in about 30 minutes. Call Accurate Tune Plus for a free estimate. Wheel alignment is all about checking the direction and angle at which the wheels are set against your vehicle manufacturer’s specifications. Even though you may hear expressions like toe in, toe out, positive camber or negative camber, wheel alignment itself is not complex. In fact, adjusting wheel alignment is actually a very straightforward operation. Positive camber is when the top of the wheel is leaning away from the car. Too much positive camber causes tires to wear on the outside edge. Negative camber is when the top of the wheel is leaning in towards the car. Too much negative camber causes tires to wear on the inside edge. The camber angle is designed and adjusted for each vehicle to optimize the tire’s behavior on the straight and during a turn. If there is too much difference between the camber angles of the front wheels, the vehicle will tend to pull to one side. Toe identifies the direction in which the tires are pointing relative to the centre line of the vehicle. Toe is usually expressed as the difference in distance between the front of the wheels and the rear of the wheels on the same axle. Toe-in is when the front of the wheels on an axle are closer together than the rear of the wheels. If there is too much toe-in, the tire tread will tend to wear more on the outside edges. The tread will also wear in a feathered manner which can be felt by running your hands across the tread of the tire. Toe-out is when the rear of the wheels on an axle are closer together than the front of the wheels. If there is too much toe-out, the tire tread will tend to wear more on the inner edges. The tread will also wear in a feathered manner which can be felt by running your hands across the tread of the tire.